Now that summer is fast approaching, you garage will probably get quite a workout. Putting gardening tools in or pulling them out, stowing away bikes, golf carts, your motorcycle or your youngster’s radio flyer, your garage floors have a busy time ahead of them. And, if you are like most people, your garage floors are also the floor you think about last. As a result, your garage floor looks old, beat up and just sad. Now is the time to have your Cave Creek concrete garage floors epoxy coated; not only to give them a much needed face lift, but also to make them easier to clean up and maintain. Everything you need to know about concrete garage floor coatings! With Cave Creek garage floor coatings as with everything else in life, the sky is the limit when it comes to the price tag, but unless you want your metallic floor coat to have genuine gold chips, there is no reason why the coating should be outrageously expensive. Oftentimes, the steep pricing comes from less than reputable floor coating professionals that either quite you unreasonable prices or try to sell your more layers than the “Princess and the Pea” had mattresses. While sometimes more coats can be a good thing, going over the top rarely is. Our epoxy and polyaspartic floor coatings are affordable, not only in their application, but also through their extreme longevity as they are extremely tear, wear and chemical resistant. 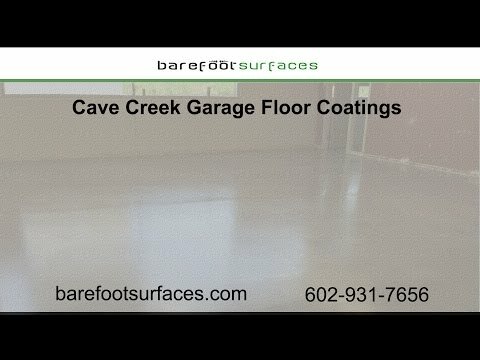 So are our garage floor coatings cheap? Well no, they are not cheap per se, but they are affordable and considering how well they bond with the substrate, how long they last and the added value to your home, they are absolutely worth it without being crazy expensive. Not quite, if that was true why would you get one. After all, your Cave Creek epoxy flooring is supposed to extend the life of the garage floor not make it an expensive hassle. While some of our clients are under the assumption that you have to recoat your floors every couple of years, that is typically not true. Most professionally applied, quality epoxy or polyaspartic coatings will last you anywhere from ten to twenty years. That’s pretty good. When will your floor coating to be redone every other year? So if your neighbor tells you how great his home improvement store kit did, he may not be very knowledgeable. I get it, we are all trying to save a dime or two and those kits are oodles cheaper than if you call a professional garage floor coating expert, but as with most things in life, you get what you pay for. While not all DIY kits are bad, the majority you can buy at the store are. If you really don’t have the funds to hire a company to do the deed, I suggest you research online and buy one of the higher and better regarded epoxy kits you can find on the internet. If you prep your floors right and apply the kit properly, you will have a decently coated garage floor. Still not as good as the professional grade your contractor uses, but much better than what the cheap box store epoxy kits would deliver. Well if that were true, we would be out of business. Paint is cheap, paint chips, paint rubs off, when you clean it, our epoxy and polyaspartic floor coats do not. What makes our coats different? They last longer, bond better with the substrate, are chemical, and wear and are made of epoxy resin, hardeners and other special components and they are thicker too. Yes, we kind of paint the coats on, but they are far from being regular paint. Our Cave Creek garage floor coatings are true workhorses, they have to be, you can park your car on it, you can pot plants and count on them releasing dirt readily making cleanup a breeze. They are true multitaskers that not only look good but perform like champs. Consider them to be “paint on steroids” if you will, but no you cannot just use paint for the same results. If we just had to sweep up dirt and dust and apply the coating, our life would be much easier too. Instead we have to properly prep the surface or you are going to have to recoat your floors every other year. And we don’t want to be that company that did crappy prep work. Depending on in what state and shape your concrete floors are we may have to grind it or even blast it to achieve a suitable surface profile that allows for proper bonding with the epoxy coat. (Of course, you can always forgo the coating process and have us grind and seal your garage floors for a pure yet industrial look, but more about that in another blog). To sum it up, yes a professional Cave Creek epoxy or polyaspartic concrete coating can be a little investment, but the payoff is well worth it. It leaves you with a fantastic looking garage floor, a surface that can stand the test of time and ups the value of your home, should you ever wanting to sell it. Additionally, keep in mind that our epoxy coats are a great solution for concrete floors inside your home as well, or outdoor epoxy coatings in Cave Creek. If you are living with an allergy sufferer, this may bring tremendous relief. Barefoot Surfaces has installed countless floor coats in Cave Creek and nearby communities. Contact us today to learn more about our various floor coatings.